What is Gidae Skin Care? Gidae Skin Care is a natural skin care product which according to its manufacturers is capable of maintaining a natural balance between the production of natural collagen which is needed to ensure that your skin is wrinkle free and breakdown caused by the aging process or even exposure to environmental factors with the purpose of keeping your skin healthy, young looking and inhibiting the show of premature aging signs on the skin’s surface. The manufacturers also say it contains ingredients that are potent enough to tighten the skin and restore its elasticity level. Who is the Manufacturer of Gidae Skin Care? The product was produced by Gidae Skin Care. The company specializes in manufacturing products such as serums and oils with the use of natural ingredients and their products. Also, there are instances where their products come in kits which all have to be used together to achieve the desired results. How Does Gidae Skin Care Work? This product according to the manufacturer has a major primary formula called the Matrixyl 3000. The purpose of this product is to renew the skin cells by enhancing the production of new ones and removing dead cells. It also contains Vitamin E which helps to replenish the skin’s moisture and keep the skin adequately hydrated. This primary formula coupled with other ingredients serves to make the product suitable for use as a skin product that may be effective for removing wrinkles and keeping the skin healthy. Gidae Skin Care Ingredients – Are they Safe & Effective? Vitamin E: It helps to make wrinkles and scars less visible and also to moisturize the skin appearance of scars. It restores lost moisture to the skin and helps to keep it hydrated and smooth. Deepaline PVB: It is an anti-wrinkle agent. It also helps to restructure the skin by eliminating dead cells and stimulating the production of new ones. Stay- C50: This ingredient helps to stimulate the production of collagen and restore skin firmness.This would help reduce the effects of the aging process on the skin. Syntacks: It is an anti-aging peptide that boosts collagen production, hydrate the skin and helps reduce the appearance of skin lines. What are the Advantages of Gidae Skin Care? The product may contain potent ingredients that may be capable of keeping the skin hydrated for a long period of time. This product according to the manufacturer can help to get rid of the wrinkles that accompany the aging process. The product is a peptide-rich solution which may help in renewing and rejuvenating dead skin cells. It may be very useful in getting rid of dark circles around the eye. What are the Disadvantages of Gidae Skin Care? It is only available for purchase by UK residents. This is very restricting. The product contains Vitamin E which when used in large quantities may be harmful to the skin. There is a discrepancy in the ingredients used for the manufacture of this product. How Should You use Gidae Skin Care? According to the manufacturers of this product, you should wash your face first then after drying it, you apply it gently in an anti-clockwise manner on your hands and neck. How Much Does Gidae Skin Care Cost? Gidae Skin Care advanced anti-aging moisturizing cream comes in basic care kit that costs for $50. What is Gidae Skin Care’s Return Policy? There is a 30 days return policy attached to the product and after this time frame, the product would not be collected from the customer. 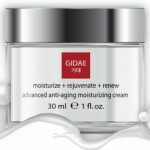 Does Gidae Skin Care Offer a Free Trial? The product can be used by both male and females. There is no free trial policy attached to the product.